Running back Luke Sweeney ’13 led all of NCAA Division III football in rushing this season, averaging 177.4 yards per game for Pomona-Pitzer and setting both single-game and single-season school records along the way. Featured in the Los Angeles Times and USA Today for his standout season, Sweeney’s path to Sagehen sports stardom began half a continent away in the suburbs of Tulsa. 1) Grow up in Broken Arrow, Okla., in a sports-loving family. Look up to your dad who was a national champion in cross country and track during his college days at Occidental. Attend first football practice in seventh grade. Get hooked on the game so much that you decide to stick with football over other sports. 2) Dominate at the high school level at Holland Hall in Tulsa, despite being undersized for your position. Score six touchdowns in one game to earn the Tulsa World Player of the Week Award. Run for more than 1,000 yards as a senior to rank in the top 10 in the state. 3) Search for a college with good academics and that will allow you to continue to play football and not ride the bench. Remember the stories you’ve heard from your parents about their college days at Oxy in Southern California. Take a close look at schools on the West Coast. Decide that Pomona is the best fit after things click when you meet the football team. 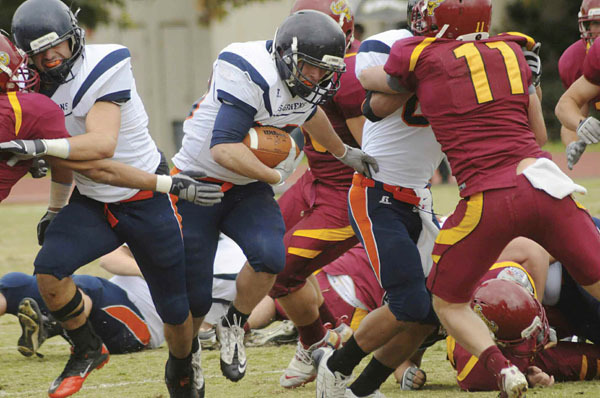 4) Bide your time as a freshman behind senior running back Russell Oka PI ’10. Play fullback and return kickoffs to get some game experience. Become the starting tailback as a sophomore. Take advantage of getting the ball more. Rush for 824 yards on the year while senior quarterback Jake Caron PI ’11 and senior wide receiver R.J. Maki ’11 set school records. 5) Rush 176 yards in the first game of the 2011 season. Prove yourself worthy of carrying the ball 30-40 times a game. Spend lots of time in the training room every week to recover. Set a single-game school record with 265 rushing yards against Oxy. Earn some family bragging rights. 6) Finish the season with a school-record 1,419 yards rushed. Earn postseason honors from SCIAC and D3football.com. Take a week or two to rest. Then hit the weight room to start preparing for senior year.